A cozinha espaçosa sala de estar, que é acima da média bem equipado, tem uma cama, uma cama extra e um sofá-cama, mesa para 5 lugares, TV, rádio, CD, Wi-Fi, máquina de lavar louça, forno, frigorífico, congelador, máquina de café, chaleira , torradeira, liquidificador, utensílios de cozimento, frigideiras, panelas, placas, pratos, toalhas de chá, rolo de cozinha, papel vegetal, sacos de lixo, e um pequeno estoque de especiarias, café, chá, cacau corte. Guias para o lava-louças e toalhas de chá estão à disposição dos hóspedes. Os dois quartos, um com cama de casal e outro com um sofá são todos eingerichitet acolhedor e elegante. No apartamento você encontrará uma pequena biblioteca, um ferro, tábua de engomar, secador de roupa, banho do bebê. Na casa você tem a oportunidade a máquina de lavar roupa para uma taxa de € 3, - para operar. O grande jardim da casa convida a relaxar. Estão nas imediações, muito boas ligações à rede de transportes (públicos). Você pode estacionar o seu carro gratuitamente na via pública em frente da casa Villa Fussenegger. ideal para férias com crianças e avós. O apartamento é decorado, em parte, decorados com mobiliário antigo. Parquet e tapetes. O apartamento tem aquecimento central - a casa está ligado ao aquecimento urbano. Custos de aquecimento estão incluídos. As camas são novos (a partir de madeira de pinho sólido - natural). A cozinha está totalmente equipada: Fogão, forno, frigorífico, máquina de lavar louça, torradas, máquina de café, aparelho de som, TV, (uso de máquina de lavar roupa para uma carga no porão, a pedido). Having holidayed several times in the Innsbruck region on ski holidays over the past years, this time we stayed in Raimund's apartment for 3 months from December through February. We choose to self-drive and the apartment is central to access the vast number of the Tirol's ski fields. It is a unique, roomy apartment on the top floor of the building, with two apartments below. It has spectacular views of the Tirol in all directions, increasing the sense of spaciousness. It is a 5min walk to the historic centre of Hall In Tirol and it's lovely cobbled streets, buildings, restaurants and shops. A number of supermarkets are within 5-10 min's walk. Train and bus transport is similarly located a short walk and parking is available on the street outside the apartment. The neighbourhood is very quiet and the area has a village and community atmosphere about it. The central heating is very comfortable and provided a lovely warm refuge after a cold day on the mountains. Facilities (full stove/oven, refrigerator, cooking utensils, etc,) are more than adequate to enable full self catering and independence and bedding was very comfortable. Though we never met Raimund, he was always available by email and his excellent English skills (like most Austrians), enabled easy communication. He was very obliging and helpful at all times. We have a special attachment for Gabriele, the lovely lady who manages the apartment in Raimund's absence and who epitomises Tirolean hospitality and helpfulness. She met us on arrival and familiarised us with everything. Subsequently she was easily contacted by phone or email for any questions, guidance or concerns and would come to the apartment to bring items that may be running short. She provides many unexpected extras/supplies that are usually not provided when renting an apartment. Her genuine friendliness was a delightful experience and we thank her for that. We also greatly appreciated the neighbours who live in the two apartments below. Again, they are very hospitable and friendly, ready to have a genuine conversation or to help with advice about the region. 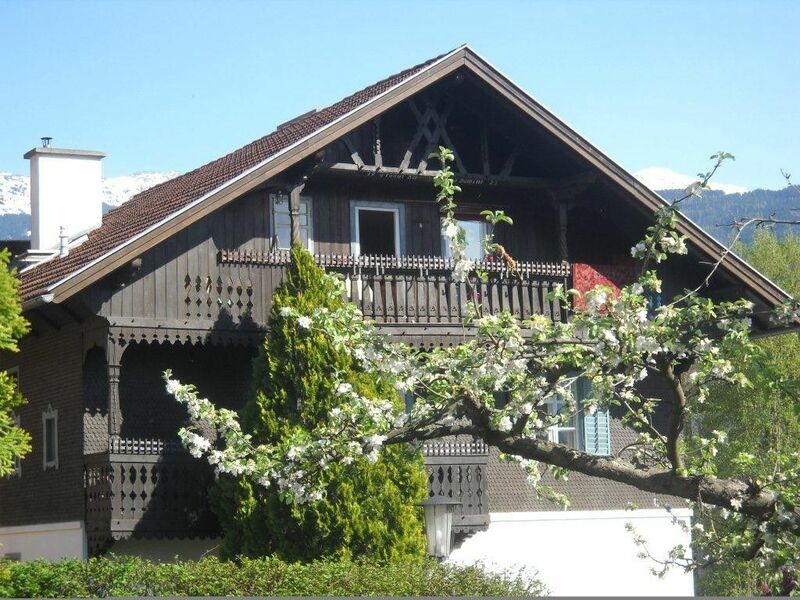 So overall, Raimund's apartment enabled a much more realistic and genuine experience of the Tirol than a package holiday, as you have the opportunity to reside in a special 'village' community with comfort, independence and support. Highly recommended. Lovely, spacious, warm. Truly a home away from home. My wife and I came from Vancouver, BC, to visit family and friends in and around Innsbruck recently and stayed in this lovely apartment. It has everything you need for a comfortable vacation. The wooden furnishings and art and decorations make it truly feel like a home.The kitchen is well equipped to cook and serve all of your meals and there is a large, solid dining table with comfortable chairs. We prepared a family dinner for 6, and had a wonderful evening. The skylights bring in lots of light and offer a view of the mountains, and can be opened for some fresh Tyrolean air. All of Hall is within a short walk and Innsbruck is a quick bus ride away. You can get to the Autobahn by car in under 5 minutes. There are local people renting the apartments on the lower levels so a bit of courtesy is called for. Taking a shower in the tub takes a little choreographing, because of the steep roof line, it his an attic space after all. But it adds to the charm of the place. We want to come and stay again, longer this time and in a warmer season. Wij waren daar voor het WK wielrennen. Daarvoor was de woning ideaal gelegen. 2 minpunten. Een hoger bed was prettiger geweest. Voor grotere mensen is de bad-douche onder het schuine dak wat onhandig. Charming, gemutlich and a super location!! Die Wohnung ist gut ausgestattet, schön hell und ausreichend groß. In wenigen Minuten zu Fuß ist man im Zentrum von Hall und mit dem Bus auch schnell in Innsbruck. Clean, great location and convenient to old town. Perfect place for a family of five to relax, and to really embrace the Innsbruck experience. We would stay here again! Férias Região Hall - Wattens Innsbruck, para experimentar. Cultura e Esportes para todas as idades. Tudo o que você preferir, você vai ficar impressionado. salto de esqui Bergisel ou bob executar Igls maravilha? Mas mesmo durante a noite têm Innsbruck e Hall oferece. "Music in the Giant" nos mundos SVAROVSKI cristal em Wattens. a poucos minutos de deixar a mente vagar. os cristais de Swarovski Crystal Worlds mergulho? ponto de partida ideal para desfrutar de suas férias.